HP SET Result 2017 conducted on 6th May 2018 will soon be available on Himachal Pradesh PSC Website www.hppsc.hp.gov.in. Himachal Pradesh Public Service Commission may also subject wise HP SET Cut off Marks 2018 during the publishing of HP State Eligibility Test Merit list. So keep visiting our portal to get link for checking HPPSC HP SET Result 2018. Latest Update: Maybe HP SET Result 2018 will be published at the end of October. Check here – SBI PO Syllabus 2018 Exam Pattern Download. 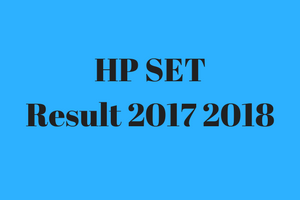 HP SET Result 2017-18 Expected Cut Off Marks HPPSC: The result of the Himachal Pradesh Public Service Commission State Eligibility Test 2017-18 for the post of Assistant Professors in 22 subjects will be published in the official website of HPPSC : www.hppsc.hp.gov.in shortly after the commencement of the written examination in February or March 2018. HP SET Expected cut off marks may also be discussed in the comments section. Organisation Himachal Pradesh Public Service Commission. Name of the Posts Assistant Professor. Exam Type State Govt Jobs. Result Publishing Date June 2018 Expected. The preparation of the Merit list of Himachal Pradesh Public Service Commission State Eligibility Test 2017-18 for the post of Assistant Professor in 22 subjects will take place considering the performance of the candidates in the OMR based written examination. The written test consists of 3 papers and all of them will be conducted on the same day. Paper-I and Paper- II will bear 100 marks each and have 50 questions respectively , Paper – III will consist 75 questions and total 150 marks. The candidates need to appear in each of the papers otherwise their candidature will not be considered. The Paper-I examination will be conducted from 10am to 11.15am, Paper – II from 11.30am to 12.45pm and Paper- III will commence from 2.30pm to 5pm on the same day. Also check Patwari Recruitment 2018. Though the date of the publication of the result for SET Asst. Professor has not been announced by HPPSC till date but as it gets announced we’ll inform you about it through our website www.jobsandhan.com. Apart from that the commission will also intimate the successful candidates individually about their results. The marks of the candidates will be uploaded in the website of the commission. We will update the link for checking result online once uploaded officially. The top 6% candidates scoring high in the merit list (after publishing of result) of HPPSC State Eligibility Test for the post of Assistant Professor , appearing in all 3 papers of the written examination and scoring cut off marks (General- 40%, SC/ ST /PH / OBC – 35%) in aggregate will be declared to be qualified. The benefits of reservation will only be acquired by the residents of Himachal Pradesh only. The reserved category candidates belonging to other states will be considered as General category. Expected cut off for HP SET 2017?? ?